where does our water go? Climate change is affecting the Okanagan in various ways – from flooding, to repeated droughts, to fires. But we have solutions! It is time to put those solutions into action for a secure water future! We all have a voice and the power to make a positive impact! JOIN US! 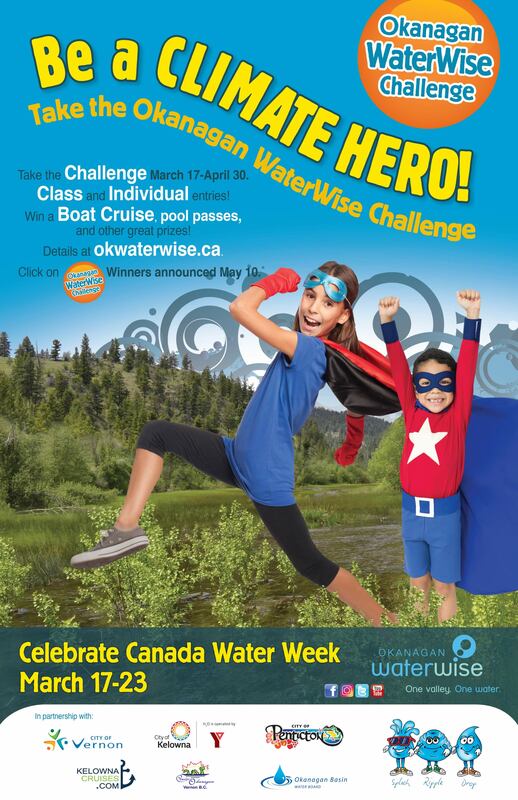 As part of Canada Water Week, Okanagan WaterWise invites school classes and individuals throughout the Okanagan, from Kindergarten to Grade 12, to be Climate Heroes and encourage others to get involved! ALL participants receive a prize, AND are entered to win a Grand Prize! March 17, 2019 as part of Canada Water Week (March 17-23). What would a Climate Hero do to protect our water in the Okanagan? What does a Climate Hero look like and what are her/his characteristics and skills? How are you a Climate Hero? As youth, you have the power to be leaders in your community, find your passion and your power. As Climate Heroes, what are you doing do to protect our waters as we face the challenges of climate change? How can others join you? What would a Climate Hero do to protect our water in the Okanagan? What does a Climate Hero look like and what are her/his characteristics and skills? How are you a Climate Hero? Show us! As a Climate Hero, what are you doing to protect our waters as we face the challenges of climate change? Show us and share ideas on how others can help. Hint: Check out this teacher-student background information on climate change for ideas to be a Climate Hero. Also check out the Okanagan WaterWise website to learn more about Okanagan water and more project ideas! While there, find our “Climate Change & Water in the Okanagan” infographic. CONTEST RULES: *Please read carefully! 1. Entries may be classroom or individual submissions. 2. Class submissions must show team-work. 3. The contest is open to classes and individuals in the North Okanagan, Central Okanagan and South Okanagan. 4. Entries must be multimedia and a combination of at least two of the following: video, audio, animation, images, or text. Entries could be a video, a song, poster, or a photo essay… Let your imagination go! 5. Video and audio entries must be limited to 2 minutes. 6. Entries should reference “Okanagan WaterWise”, or “OkWaterWise”, or being “WaterWise”. 7. Entries should incorporate information about Okanagan water issues. Information can be found on the Okanagan WaterWisewebsite. Engaging, simple and easy for others to do too! 9. Contestants can submit their entry to the Okanagan Basin Water Board office at 1450 KLO Rd., Kelowna, B.C., V1W 3Z4, or by e-mail to [email protected]. Large files can be submitted to a file-sharing website. Contact 250-469-6271 for details. the name AND age of the individual (if it’s an individual submission). 11. All entries become the property of the Okanagan Basin Water Board (OBWB) and Okanagan WaterWise. By submitting an entry in the contest, the contestant agrees that OBWB has the right to use the submission for promotional purposes including publication and exhibition on the Internet and for presentations. Pizza for the classroom, plus pool passes to your local pool, and your winning entry featured on the Okanagan WaterWise website! *OPTION for winning class: a 2-hour boat charter on Okanagan Lake for an on-the-water classroom experience, instead of pizza and pool passes. 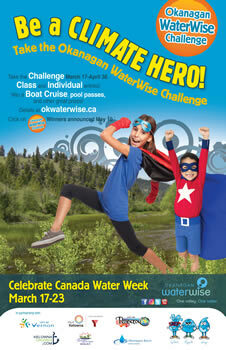 Includes a private class lesson on Okanagan water! Pizza and pool passes for you and four friends to your local pool, and your winning entry featured on the Okanagan WaterWise website!